CORAM: HON'BLE MR. JUSTICE INDERJIT SINGH Present: Mr.A.K.Sama, Advocate for the petitioner. Mr.K.S.Aulakh, Asstt. 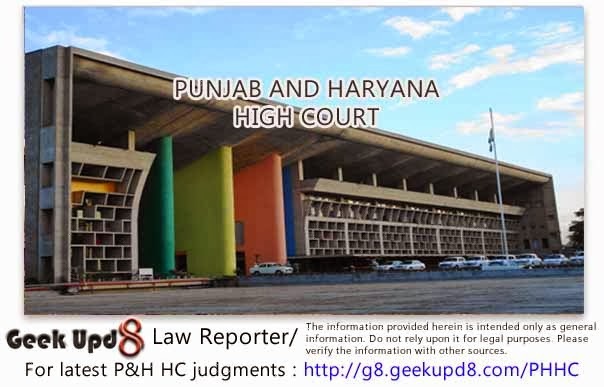 Advocate General, Punjab for the respondent-State. Channa Singh has filed this revision petition against State of Punjab under Section 401 Cr.P.C. challenging the order dated 11.12.2013 passed by Addl. Sessions Judge, Fazilka and the order dated 27.11.2013 passed by Principal Juvenile Justice Board Fazilka. It is mainly stated in the petition that petitioner has been falsely implicated in FIR No.200 dated 22.11.2013 under Sections 354-A, 354-D, 341, 506 and 120-B IPC and Section 3A/4 of Protection of Children from Sexual Offence, 2012 and the petitioner has not committed any offence. It is further stated in the petition that the impugned orders passed by both the Courts below are not as per law. The petitioner is minor and his date of birth is 02.04.1996 and is studying in 10th class. CRR No.117 of 2014 -2- At the time of arguments, learned counsel for the petitioner argued that the order passed by the learned Juvenile Justice Board and the order passed by learned Addl. Sessions Judge, Fazilka dismissing the bail application of the petitioner are illegal. I have gone through the order dated 27.11.2013 passed by learned Juvenile Justice Board, Fazilka. The reasoning given for dismissing the bail application is that the petitioner/juvenile has committed a heinous crime. His mentality shows that he is not being brought up in healthy atmosphere and thus, his release on bail would defeat the purpose of justice. Learned Addl. Sessions Judge, Fazilka in the impugned order dated 11.12.2013 passed in the appeal against the order passed by Juvenile Justice Board, also dismissed the appeal by giving reason of gravity of offence. Section 12(1) of Juvenile Justice (Care and Protection of Children) Act, 2000 (for brevity 'the Act') provides as under:- "12. Bail of juvenile.- (1) When any person accused of a bailable or non-bailable offence, and apparently a juvenile, is arrested or detained or appears or is brought before a Board, such person shall, notwithstanding anything contained in the Code of Criminal Procedure, 1973 (2 of 1974) or in any other law for the time being in force, be released on bail with or without surety but he shall not be so released if there appear reasonable grounds for believing that the release is likely to bring him into association with any known criminal or expose him to moral, physical or psychological danger or that his release would defeat the ends of justice." CRR No.117 of 2014 -3- grounds for believing that the release is likely to bring him into association with any known criminal or expose him to moral, physical or psychological danger or that his release would defeat the ends of justice. The orders passed by both the Courts below are against the provisions of Section 12(1) of the Act and are illegal and are set aside. Therefore, finding merit in the revision petition, the same is allowed and the petitioner is ordered to be released on regular bail on furnishing bail bonds in the sum of `30,000/- with one surety in the like amount to the satisfaction of the learned Juvenile Justice Board, Fazilka.